The 2018 World Cup is only a short back-pass away. It’s not long until Russia kick it all off against Saudi Arabia, England get knocked out in the Group Stage and Germany win it again. So, what better time than now to take a quick look back at some Man of the Match marketing from World Cups past and present. I’ve put together a 5-a-side team of noteworthy work for you to cheer, boo or dismiss with a straight red. My earliest world cup memory was watching Frank Rijkaard spit into Rudi Voller’s mullet during Italia ’90, but my earliest WC marketing memory was this legendary TV spot from Nike. Thanks to the success of the Premier League, the late 90s became the golden era of football TV advertising, and this was the pinnacle. Nike vs Adidas (the official World Cup sponsor) was the biggest battle of the 98 Coupe Du Monde. And Nike stormed to victory by teaming up with Ronaldo (the original), Romario, Roberto Carlos etc… Sports advertising has never been better. It began a little before my time, but this 1970 World Cup promotion went on for many tournaments after thanks to its popularity. 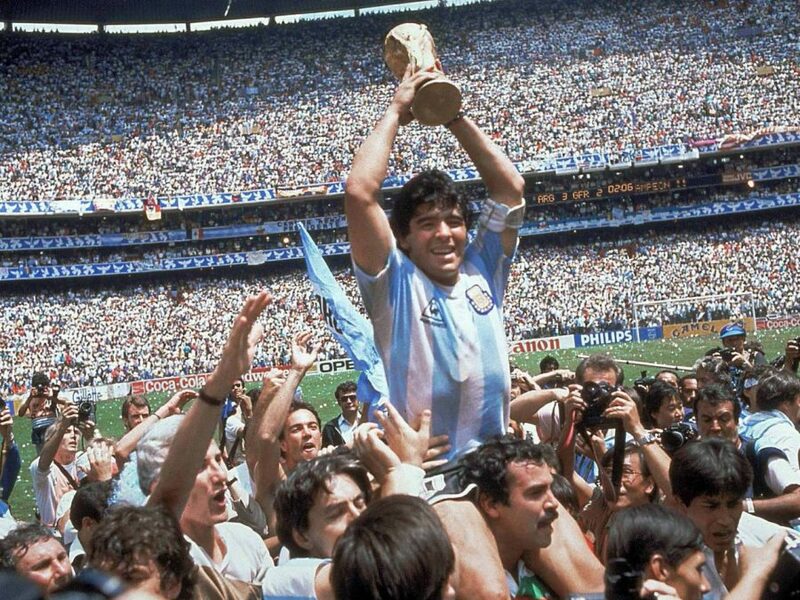 Given away with every four gallons of petrol, the Esso World Cup collectors coins were a big hit. 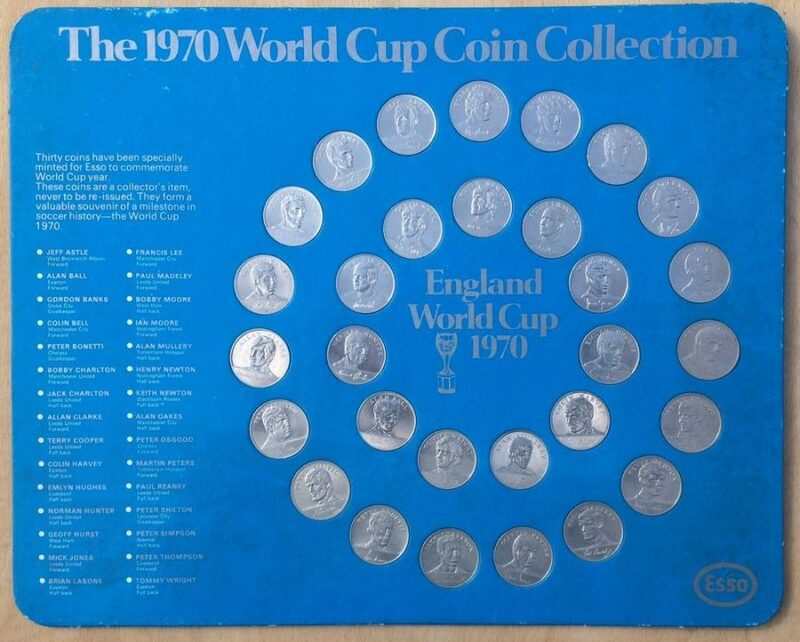 30 shiny pieces of silver depicting players of the legendary England squad that went to Brazil. A full tank for a gleaming Gordon Banks, it’s a brilliant and memorable campaign that has become a sought-after collector’s item. It’s common knowledge that Scotland rarely qualify for the World Cup but in 2006 a Scotland did. 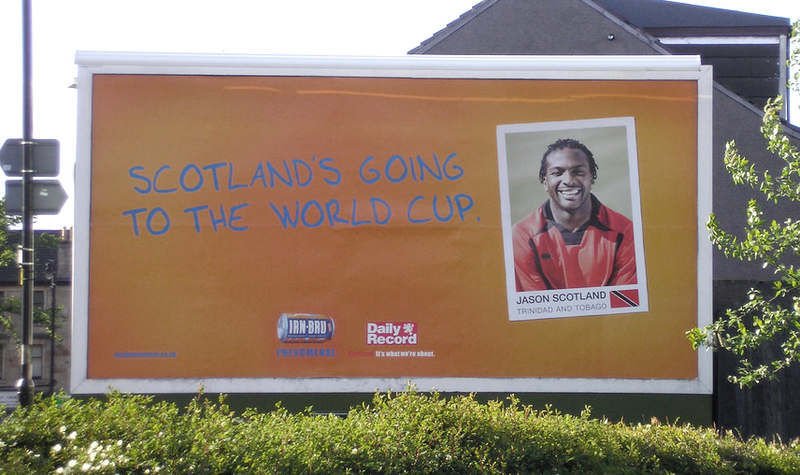 Jason Scotland, who played for St Johnstone, was a Trinidad and Tobago international and they had qualified. Jumping on this insight, Irn-Bru generated some buzz during the biggest sporting event on earth. This low budget integrated campaign is clever, witty and simple, and a great example of how to stand out when you’re not an official sponsor. It was also Scotland’s best World Cup moment since Archie Gemmill ran rings around Holland. Twitter ranks highly as a go to source of news and insight for armchair supporters. Paddy Power understood this better than the official FIFA sponsors and ended up winning the 2014 World Cup with a single image that they released on the dark web. The tournament was being held in Brazil so PP posted a picture showing the words “C’mon England PP” carved into the Amazon rainforest, it looked real but it wasn’t. Great stand out and bang on brand, this guerrilla campaign understood social and the terrace mentality of its target audience. Now for some Russia 2018 work. Vivo are a Chinese smartphone brand struggling to stand out in a saturated domestic market so they’ve paid the very large rights fee to become the latest official World Cup sponsor. They’ve put their smartphone’s camera capability at the heart of their campaign as they aim to turn spectators into content creators. The Vivo Super Fan Photographer programme will provide fans with a smartphone and access to pitch-side, stadium and warm-up sessions to capture exclusive content and share it with the world. This will showcase the USP of the phone and make full use of that pricey FIFA licence. It’s a smart strategy as the reactions of other fans is something the global TV audience will actively seek out on social media. Vivo will be hoping for a footy version of ‘Shot on an iPhone’ but a touchline selfie-fest could end up being an own goal. And coming off the bench to score a last gasp winner is the BBC Russia 2018 title sequence. This animated film is made up of individually embroidered textile frames of famous World Cup moments that are stitched together to create a stunning tapestry. Throughout the tournament the tapestry will be added to with moments from this World Cup, before finally being displayed at the National Football Museum in Preston. A beautifully crafted film that not only does it’s intended job as a trailer and titles but also has a life beyond TV.